I'm more of a "watch the world burn" kind of guy, can I still get my rocks off? We've got your pleasure, sir. With the Destruction style Overlord you can ravage the land like a moody Tsunami; razing cities, forests and Imperial camps to the ground just because they looked at you funny. What can my minions do? Minions are angry little Swiss army knives of pain: They can ride into battle on wolves and other magical creatures, loot the best weapons from stomped enemies, pillage houses for treasure, operate fearsome war machines, infiltrate enemy camps and polish your armour so thoroughly you'll blind passing wildlife. © 2009 The Codemasters Software Company Limited ("Codemasters"). All rights reserved. "Codemasters"®, “Overlord”® and the Codemasters logo are registered trademarks owned by Codemasters. “Minions”™ is a trade mark of Codemasters. All other copyrights or trademarks are the property of their respective owners and are being used under license. 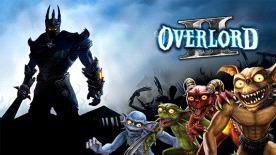 Original Overlord Game Concept by Lennart Sas, Arno Van Wingerden and Triumph Studios. Unauthorised copying, adaptation, rental, lending, re-sale, arcade use, charging for use, broadcast, cable transmission, public performance, distribution or extraction of this product or any trademark or copyright work that forms part of this product is prohibited. Developed by Climax Group Limited and published by Codemasters.